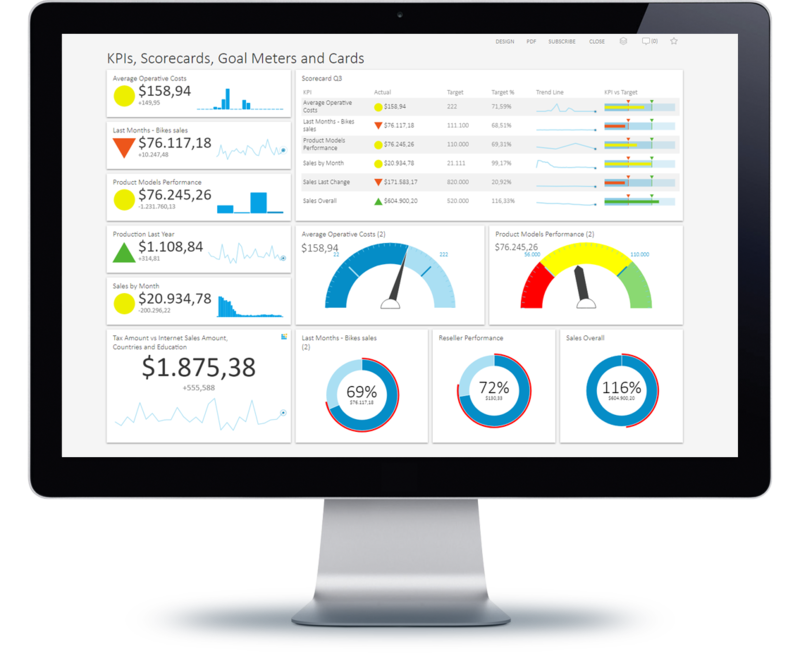 Monitor success of your business goals with KPI Dashboard that is organized with KPIs, Gauges, Scorecards and other charts that are based on your SQL, OLAP, ODBC or CSV data with Kyubit BI tools. 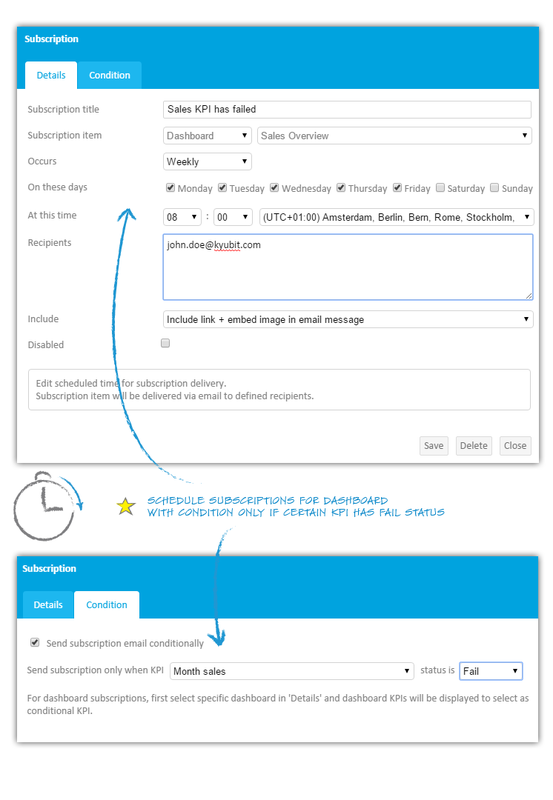 Set alert emails that are triggered by particular KPI status. After you define values that could be used to measure your business goals, it would be great if you can use your own data sources to display a KPI dashboard that reflects your current situation or the situations in the last period of your business. It is very likely that you have your own business values in Excel/CSV files or SQL/OLAP databases and you just need a tool where you would quickly define your KPIs with success and fail thresholds and present it in the form of the web page that is easily accessible and shared with other authorized users. Kyubit BI tools include KPI creation features where you will quickly define your KPIs and create a dashboard where KPIs and other data visualizations will be displayed with its current status and latest values. 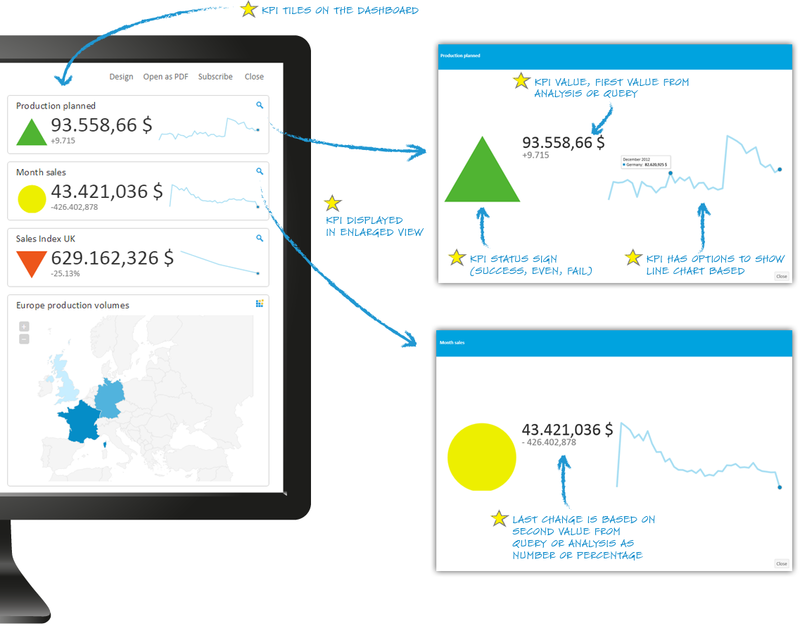 Each time dashboard is opened, real-time data from your data sources are used to display current KPI status with historic values. KPI could be presented as a KPI icon with current values, last change and line chart presenting KPI values in the recent period. 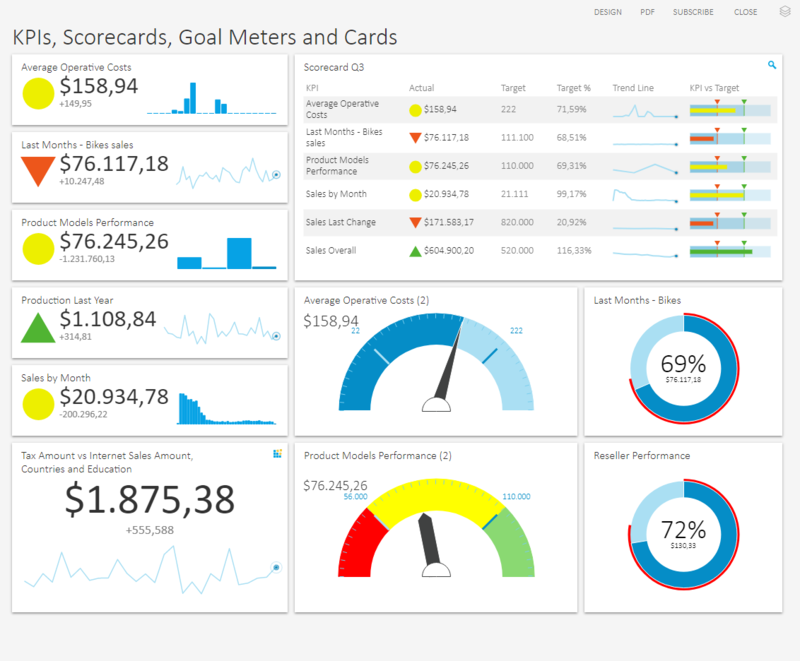 Another way is to display the same KPI as Gauge, Goal meter visualization or organize multiple KPIs into Scorecard that lists multiple KPIs with related data. KPI Dashboard is accessible from web browsers or mobile devices using various authentication mechanism. KPI Dashboard could be exported to PDF file or users can subscribe to receive dashboard with most recent data on email at the scheduled time. Once created, KPI (Key Performance Indicator) could be re-used on many dashboards with respect to defined permissions on the KPI. 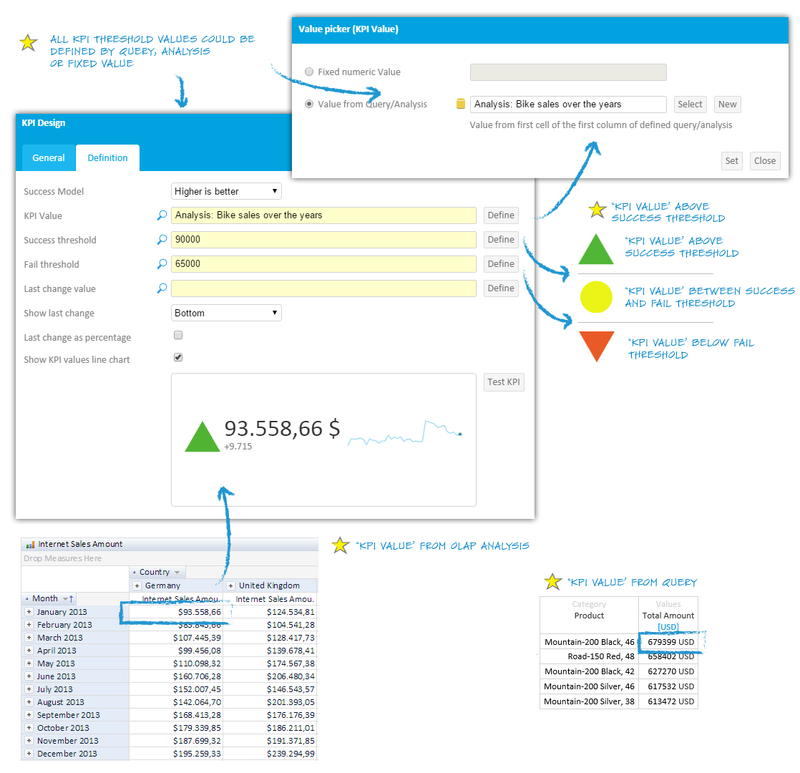 All available KPIs to current user are visible in ‘Dashboards’ -> ‘KPI’ section of Kyubit BI application. 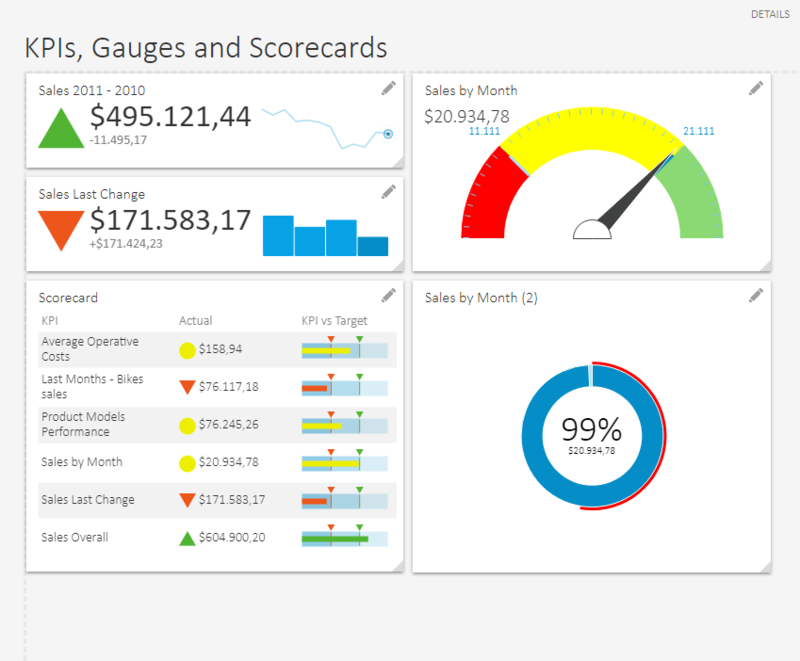 Kyubit BI Tools KPI dashboards include Scorecards and KPIs that connects to your OLAP, SQL, ODBC, CSV data to create KPI status, indicators, metrics and charts that quickly indicates the current status of important values within your data environment. 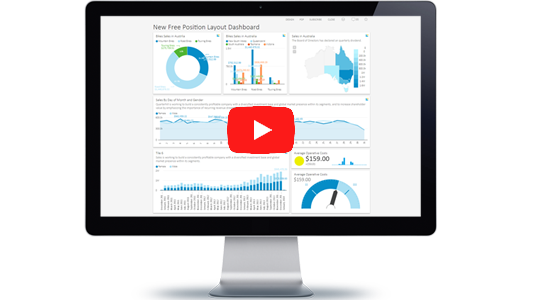 Kyubit Scorecard and KPI software include KPI visualizations that are easy to design and implement on dashboards together with other important visual metrics. KPI status is represented with the current value, KPI icon or Gauge and a small line chart that presents recent changes of values in time. Organize multiple KPIs to Scorecards that displays KPI Goal, Target, Target percentage and trend lines. 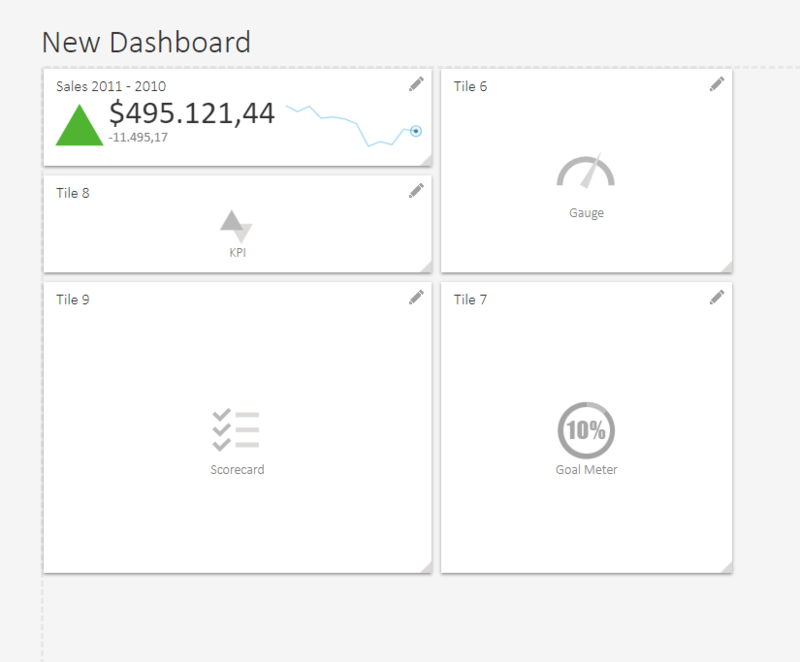 The Dashboard could contain any number of KPI tiles. Click magnify icon to display KPI in an enlarged view. KPI consists of the current value, last change and KPI status sign (Success, Even, Fail). KPI has the option to display line chart that presents recent KPI value changes, based on KPI definition (see next section). 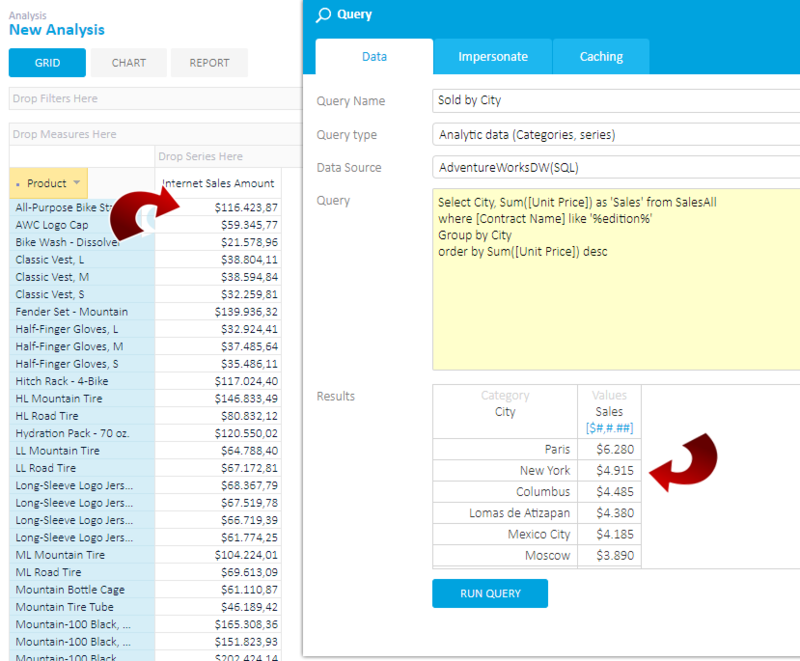 When the value is defined using query or analysis, 'KPI Value' is always fist value from dataset. 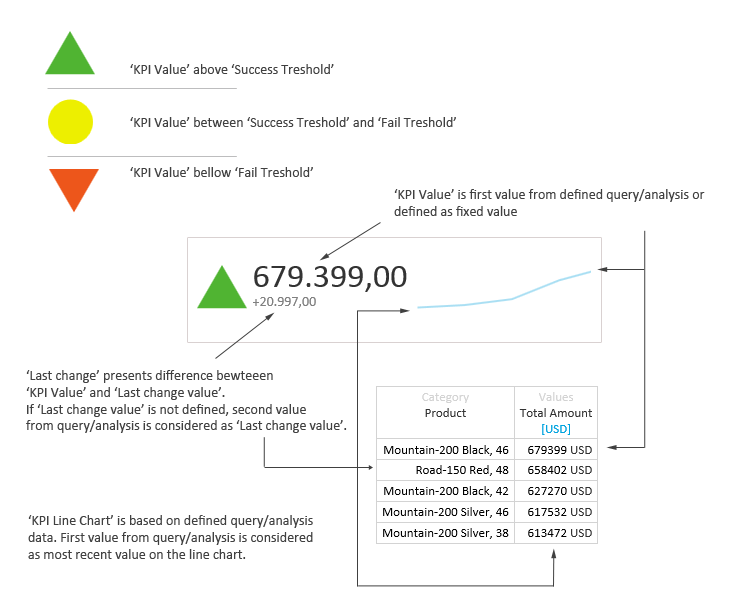 When the value is defined using query or analysis, 'KPI Last Change' is defined by the relation between the first and second value from dataset. Visualize previous KPI values by setting a line chart that illustrates how KPI value has changed recently. Organize multiple KPIs on a single Scorecard list that presents each KPI success, values, target, target percentage, recent values as small line chart and visual progress of the current value from 'Fail' to 'Success' status (value bar). KPI Design form offers everything on one place to create KPI in Kyubit BI application. KPI Name, defines the full name of the KPI in the system. KPI Short Name, will be used on places (mobile device), where space is limited. KPI Description, simply describes KPI definition for other users. Success Model, defines if higher values are more successful or lower values are more successful. KPI Value is the actual value that is tested for KPI success. Could be configured as ‘Fixed numeric value’ or value from ‘Query/Analysis’. Success threshold, defines limit above KPI status is considered as ‘Success’ and marked with the green arrow icon. Could be configured as ‘Fixed numeric value’ or value from ‘Query/Analysis’. Fail threshold, defines limit bellow KPI status is considered as ‘Failed’ and marked with the red arrow icon. Could be configured as ‘Fixed numeric value’ or value from ‘Query/Analysis’. If KPI value is between ‘Success’ and ‘Fail’ limit, KPI is in the ‘Even’ status and marked with the yellow circle. Last change as percentage, defines if last change will be displayed as the percentage or regular delta value. Show KPI values 'Line chart' or 'Column Chart', defined if line chart will be visible next to KPI to reflect changing of KPI value in recent time, up to last (current) value. KPI data feed is based on series of values (first series of analysis/query) and the first value in series is considered as current value to be evaluated for KPI, previous values are considered as historic and could be displayed as list chart next to KPI indicator. When all inputs are selected, click on ‘Test KPI’ to immediately display KPI visualization and perhaps make some adjustments, before it is saved. Download 30 days evaluation of Kyubit BI Tools and see Kyubit KPI software features in action. Download 'Kyubit BI Tools - User Manual' which covers all aspects of Kyubit BI Tools and KPI Dashboards.